There are many venues and resources for children’s birthday parties available in New Hampshire and Massachusetts. Please visit the links below for extensive lists and information on local party venues and businesses. In addition, my birthday party pages will include featured advertisements. If you see a party spot featured on a page then it is a NH Kids favorite! I hope this is a helpful tool in planning your child’s special day! Animal and Nature Parties: Please visit this link to view an extensive list of Animal and Nature Birthday Party venues. Arty Parties: Please visit this link to view an extensive list of Arty Birthday Party venues. 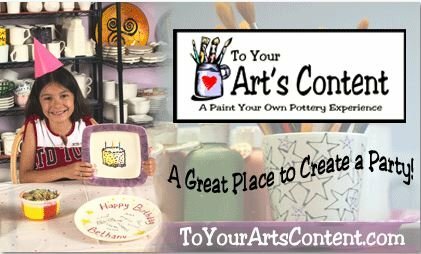 To Your Art’s Content is a paint your own pottery studio offering three kiln fired arts, Pottery Painting, Glass Fusing, and Clay! They have been in business over eight years, exciting your imagination and creativity with Birthday Parties, Classes, and regular Walk-In hours. Birthday parties are a blast, with a private room, personal art instructor, and unlimited creativity. With projects ranging from baby footprints to advanced art designs, everyone can have fun creating To Your Art’s Content! I am happy to feature To Your Art’s Content as one of NH Kids favorite party spots! Graffiti Paintbar is a painting studio located in Nashua, NH that holds canvas painting classes for all ages and hosts wonderful, creative birthday parties for kids! Party prices begin at $25 per child and include all painting supplies, 2 hours of step-by-step guided artistic direction and party time. When the party is over, each child will leave with their own unique 16″ x 20″ canvas masterpiece. For more information on Graffiti Paintbar’s birthday parties and their children’s programming please visit their website. I am happy to feature Graffiti Paintbar as one of NH Kid’s favorite party spots! Cooking Parties: Please visit this link to view an extensive list of Cooking Birthday Party venues. Home Entertainers: Please visit this link to view an extensive list of Home Entertainers. A Party Palace creates themed birthday parties your child in the comfort of your home. They offer several party packages tailored to make your child’s special day magical. I am happy to feature A Party Palace as one of NH Kids’ favorite party businesses! Indoor Play and Bounce Parties: Please visit this link to view an extensive list of Indoor Play and Bounce Birthday Party venues. Jump Around Play Center provides a clean, fun and safe place for kids to Jump Around on inflatables and celebrate their big day! Jump Around offers Birthday packages starting at $200.00 and Unique/Exclusive party package options with the NH Sportsplex. In addition, Open Play times are available to bring the kids in and let them Jump Around! I am happy to feature Jump Around Play Center as one of NH Kids favorite party spots! Nuthin’ But Good Times offers 5 different party options with many add-on features that make it easy for you to customize your own package for your child. Packages include food and drink, a party hostess and two hours of party fun! Additionally, each birthday child gets to paint their handprint on Nuthin’ But Good Times’ wall! I am happy to feature Nuthin’ But Good Times as one of NH Kids favorite party spots. Movie Parties: Please visit this link to view an extensive list of Movie Birthday Party venues. Museum and Science Center Parties: Please visit this link to view an extensive list of Museum and Science Birthday Party venues. Party Rentals: Please visit this link to view an extensive list of Party Rental Options. Jump Around Rentals offers a great selection of rental inflatables with unmatched service! You won’t need to worry about how to get your bounce house home as ALL rentals include FREE delivery within 15 miles! Rentals start at $145.00 a day. I am happy to feature Jump Around Rentals one of NH Kids’ favorite party spots! Retail Store Parties: Please visit this link to view an extensive list of Retail Store Birthday Party venues. Sports Team Parties: Please visit this link to view an extensive list of Sports Team Birthday Party venues. Zoo and Aquarium Parties: Please visit this link to view an extensive list of Zoo and Aquarium Birthday Party venues.